Iconic Australian duo Air Supply takes us back to the 80’s for a special one-night show on 31 May 2018 at the Santa Rosa Sports Coliseum in Sta. Rosa, Laguna. This year’s Philippine concert is the first of several shows part of their Over Asia 2018 Tour following dates all over Canada and the United States. Still supplying the classic hits 43 years since the release of their debut album, singer-songwriter and guitarist Graham Russell and lead vocalist Russell Hitchcock celebrate their trademark soft rock sound by serenading us once again with their massive catalog of evergreen love songs. 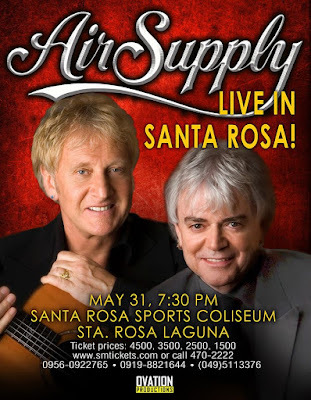 Air Supply began its humble musical journey opening for Rod Stewart back in Australia and eventually across North America and Canada, breaking through a whole new U.S. audience. Subsequent to their fourth studio record, Life Support, was the success of many beloved songs, including “Lost in Love” which unexpectedly rose to Top 10 in Australia. Their refreshing take on soft rock music somehow found its way to the distinguished Arista Records in New York. Immediately after the duo signed with the label, "Lost in Love" became the fastest-selling single in the world, leaping to the top of the charts worldwide. The band’s second single, "All Out of Love," attracted more fans and reigned the charts even longer. Eight Top 10 hits later, "Lost in Love" was named Song of the Year in 1980, and, with the other singles, sold more than 10 million copies. Russell Hitchcock's soaring tenor voice and Graham Russell's pure yet majestic lyrics have created a warm signature sound that would live on for a very long time. Other hits of Air Supply are Making Love Out of Nothing at All, The One That You Love, Here I Am, Two Less Lonely People, Every Woman In the World, Sweet Dreams, I Can Wait Forever, Lonely Is the Night, Having You Near Me, to name a few.